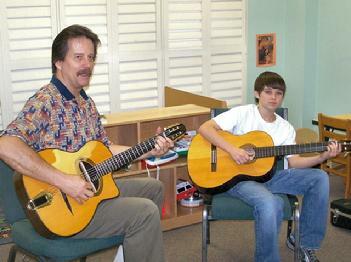 Instructor Roy Cox (left) is an accomplished guitarist who teaches students how to read music and play guitar. The Music Ministry of Central Baptist Church in Livingston, Texas, has been reaching out to the church and community through a program called The School of The Arts since September 2002. Private 30-minute lessons are given on Monday evenings from 3:00 - 10:00 p.m., from September, through May. The purpose and mission of this program is to offer instruction and personal development in music. It is our belief that the arts are a gift from God and that the opportunity to develop these gifts allows us to grow both mentally and spiritually. The School of The Arts is founded on Christian principles, and its programs are available to everyone in the church and community. The school offers a nine month program with classes for children, youth and adults. Signing up for classes requires the completion of a Registration Form plus the first and last month�s tuition and a $50.00 Registration Fee. Lessons are offered to children, youth and adults. Tuition listed is a flat monthly fee. For lesson availability call 936-328-8682. Leave a voice mail message and your call will be returned as soon as possible. You can also visit the School of the Arts Web Page. On the SOTA web page you can print a student registration form, read SOTA policies, view contact information, view the SOTA calendar for 2008/2009. Interview with SOTA founder, Joel Salazar.